Recent release “Memoirs of a Prison Lawyer: Prisoner’s Wife” from Page Publishing author Claudette Spencer-Nurse is both an inspiring love story and a behind-the-scenes look at prison life from the perspectives of an inmate, his wife, and his attorney. Claudette Spencer-Nurse, a Brooklyn-born attorney and social justice activist currently working for Habitat for Humanity in Trinidad, where she lives with her husband, Ernest, has completed her book “Memoirs of a Prison Lawyer: Prisoner’s Wife”: a deeply personal reflection on a life spent fighting for justice and the enduring love she found in the unlikeliest of places. Published by New York City-based Page Publishing, Claudette Spencer-Nurse’s book is a stirring autobiography of justice, commitment, and the power of love. 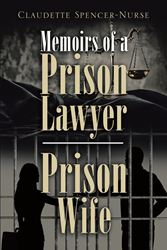 Readers who wish to experience this engaging work can purchase “Memoirs of a Prison Lawyer: Prisoner’s Wife” at bookstores everywhere, or online at the Apple iTunes store, Amazon, Google Play, or Barnes and Noble. For additional information, contact Claudette Spencer-Nurse at 631- 374-0042 or 631-932-3095 or cspencernurse@gmail.com or on Twitter and Instagram @cspencernurse or on her Facebook page.